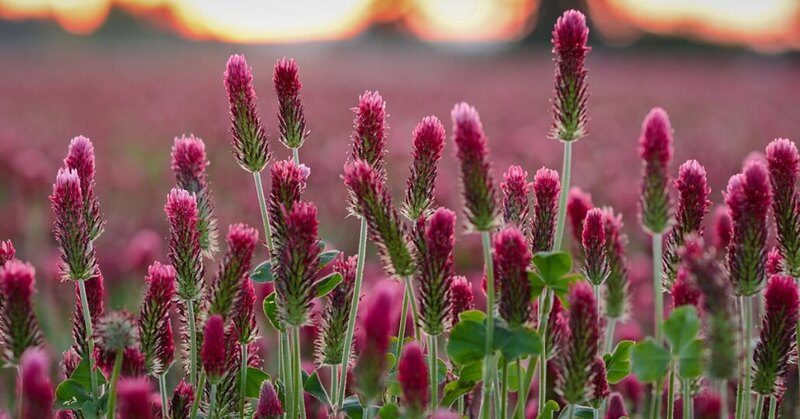 One of the chief ingredients of Sir Jason Winters teas is red clover (Trifolium pratense). In spite of how ordinary it seems to be because you might see it almost every day either growing in your yard or growing along the roadside, it may be surprising to learn that it is considered an especially powerful blood purifier and detoxification herb. 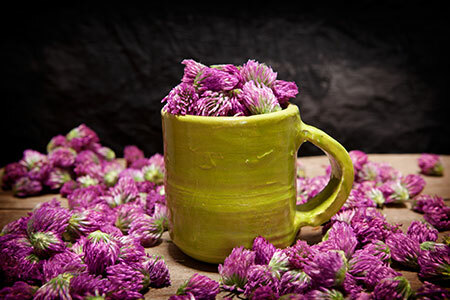 Red clover tea tastes delicious, so much so that you might even be tempted to overlook the value of this very common plant. This herb is part of the legume or bean family and can grow almost anywhere in the world. Though it was not originally native to the United States, today it grows profusely, especially in the plains states. It is often found along roadsides and is also commonly used as a choice grazing crop for livestock. Cattle feed during the winter months usually uses red clover for nutrition. Unlike the common white clover you can find in lawns and parks, red clover is a perennial plant that grows one to two feet in height. The rootstock is short and produces green to reddish-green hairy stems and pink to purple egg-shaped flowering tops. This three-leafed plant flowers in early to mid-summer when the weather is cooler and then blooms once again in the early fall. The flower heads are gathered from May through September. This is the part most often used for tea through the leaves and stems can also be used. The reddish flowers of red clover have a slightly sweet taste and can be eaten fresh right off of the plant during long walks or on lazy early summer afternoons. When Sir Jason Winters became ill and was left with little hope of recovering, he believed that through the bounty of nature’s herbs he might find the answer he was looking for in order to improve his health. There was so much information available, but where to start? One of the first places Sir Jason Winters looked in the various holy texts from around the world. The first one he examined was the Bible. Sir Jason found that the Bible made reference to an herb. But which one could it be that was mentioned no fewer than 27 times within the text? Curious as to what this herb might be, Sir Jason wrote to the Archbishop of Canterbury to see if he might have an answer. After some investigation of his own notes, the Archbishop believed that the herb Sir Jason Winters was looking for was none other than red clover. Through his correspondence with the Archbishop and his own reading and research, Sir Jason Winters determined that even in ancient times, red clover was traditionally used as a blood cleanser and tonifier. Indeed, the early Twentieth Century herbalist and author of Back To Eden, Jethro Kloss, said that “Red Clover is one of God’s greatest blessings to man.” In medieval England, the groups of three leaves on the plant were associated with the Trinity. According to American Herbalist Guild (AHG) recognized professional herbalist and naturopathic doctor, Michael Tierra, red clover is often used on its own and has a direct effect on the liver, and works to assist the body’s lymphatic system so that toxins can be eliminated from the body. Researchers at the University of Utah have found that red clover can assist the heart and lungs as well as having some estrogenic properties that can help women. This is attributed to the coumerol, a phytoestrogen which is found mainly within the flowering tops of red clover. This plant also contains flavonoids, phenolic acids, such as salicylic acid. There have been additional studies conducted which have also shown that red clover contains some antibiotic properties, particularly the pathogen which is directly connected to tuberculosis. Red clover contains Vitamin A, B-complex, B-12, and Vitamin C. The plant also contains calcium, copper, iron, magnesium, manganese, potassium, selenium, nickel and fatty acids. While red clover appears to act the lymphatic system which acts as a purifier for the liver and the bloodstream, it is antiseptic in nature and is excellent for mothers who are nursing. It is a nerve soother and slightly sedative in nature. Along with all of these great benefits, red clover is what is considered a food herb. Herbs which are classified as food can generally be consumed anytime you wish. That means you can enjoy your cup of Sir Jason Winters tea containing red clover whenever you like, sit back, relax and enjoy! As with anything, here at Sir Jason Winters International, we believe that it is always a good idea to discuss any herbs and supplements that you consume with your physician. “The Complete Writings of Dr. John R. Christopher”, (http://online.snh.cc/files/2100/HTML/100hs_red_clover__trifolium_pratense.htm ) web.